H.Samuel has been a much loved jeweller and one of the favourite high street Jeweller in UK. This diamond ring is currently on sale. It was sold at £2599. Now the price is £1163.1. Then use the £15 off voucher code to get another £15 off. 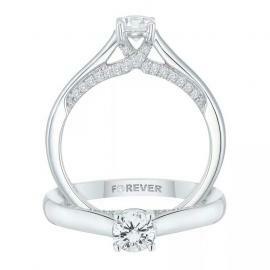 In the end, you need only to pay £1154.10 for the beautiful 1/2 ct Forever Diamond Ring. And enjoy free next day delivery. SPECIAL OFFER: Rose Gold Earrings only £29.99 (usually £54.99) with any purchase. A diamond for your past, a diamond celebrating the present and a diamond symbolizing your anticipated future together-- surprise the one you love with a glittering three stone ring. Displaying unsurpassed beauty, round diamonds frame the center stones and line the double shank as they shine brightly within a 14K white gold setting. Ask for her hand in marriage or celebrate your love during an anniversary with this amazing 1 ct. t.w. diamond ring. By Charles and Colvard. 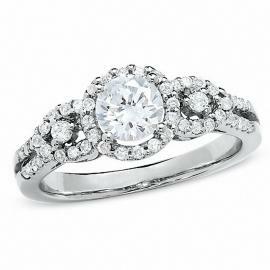 Save $851 on the sparkling Moissanite White Gold Engagement Ring. If you are underbudgeted for a diamond Engagement Ring, this is a beautiful substitution. It is sure to light up the room with this glistening stone and polished finish. Crafted from 14-karat gold, this ring features a six prong setting. 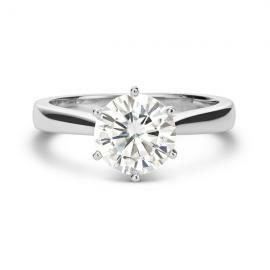 The moissanite is 1 7/8 carat total diamond equivalent weight. Each piece comes with a Certificate of Authenticity and Limited Lifetime Warranty ensuring that it will maintain its brilliance and fire, without ever fading or changing color. If your bride is an antique fancier or a romanticist, this is one of your best choices. Enjoy over 60% off original price. This sumptuous bridal set is crafted in your choice of 14-karat white, rose, or yellow gold. 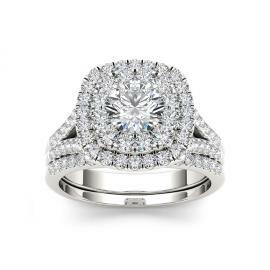 The engagement ring features a 3/4 carat, round white diamond, prong set in a cushion-shaped, double halo of white diamonds. More diamonds line the split shank and the coordinating wedding band, completing the shimmering elegance of this beautiful set. Save $440 (second round, discount goes higher). Similar Item recommended price is $999.99. If you join the Club O which is $19.95/yr, you will get another 5% rewards, which is on this case $28. Only 3 left now. Grab the offer before it's gone. 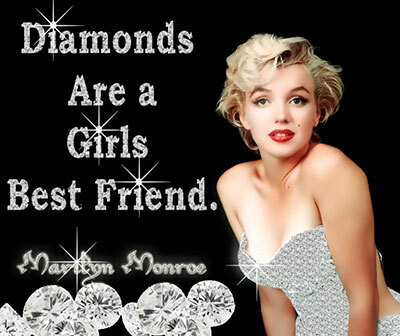 “Diamonds are a Girl’s Best Friend”, as sung by Marilyn Monroe. 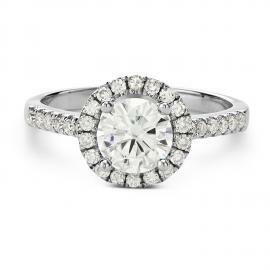 No girl could ever resist a sparkling diamond. The square-cut or pearl-shaped rocks never loose their shape. Diamonds have been known to mankind and used as decorative items since ancient times; some of the earliest references can be traced to India. From the Ancient Greek, it means “unbreakable”, “proper” or “unalterable”. No girl could ever resist a sparkling diamond. So how to buy theright loose diamond? To grade and certify diamonds, “4-Cs” have been created,which are Cut, Color, Clarity and Carat, lined in the order of importance.After understanding the four Cs, you can start to look for your own perfect diamond. The cut of a diamonddescribes the quality of workmanship and the angles to which a diamond is cut. Itis the most important of the 4Cs because it has the greatest influence on adiamond's sparkle. Even if a diamond has a perfect clarity and color grade, ifit has a poor cut, it may appear dull. When a diamond is cut with the properproportions, light is returned out of the top of the diamond (which gemologistsrefer to as the table). If it is cut too shallow, light leaks out of thebottom; too deep and it escapes out of the side. Diamond cut can be classified into 5grades. Super Ideal / True Hearts: True Heart Diamond is cut to gather andreflect the most light possible. Light performance is measured by threefactors: brilliance, fire and sparkle. Fewer than 15 out of every 10,000diamonds qualify as an true heart diamond. Ideal: This rare cut represents roughly the top 3% of diamond cutquality. It reflects most light that enters the diamond. Very Good: This cut represents roughly the top 15% of diamond cutquality. It reflects nearly as much light as the ideal cut, but for a lowerprice. Good: This cut represents roughly the top 25% of diamond cutquality. It reflects most light that enters, but not as much as a Very Good cutgrade. Poor/Fair Cut: Represents roughly the top 35% of diamond cutquality. These diamonds tend to appear dull or glassy. Most online loosediamond suppliers do not offer poor cut diamond. Diamonds come naturally in every color of the rainbow. However most people are concerned with diamonds which are basically transparent with little tint or white diamonds. The Gemological Institute of America (GIA) rates the body color in white diamonds from D (colorless) to Z (light yellow). Most diamonds contain very tiny birthmarks known as "inclusions." An inclusion can interfere with the light passing through the diamond. The fewer the inclusions, the more beautiful the diamond will be and the higher the clarity grade. Diamond clarity is often the least important of the 4Cs because most inclusions are microscopic; they don’t affect the diamond’s beauty in a visible way. FL, IF: Flawless, Internally Flawless. Under 10x magnification, inclusions are not visible, rarest clarity grade. VVS1, VVS2: Very, Very Slightly Included. Characteristics minisculeand difficult to see under 10x magnification, even to a trained eye. VS1, VS2: Very Slightly Included. Minor inclusions ranging fromdifficult to somewhat easy to see at 10x magnification. SI1, SI2: Slightly Included. Inclusions noticeable at 10x. Bestvalue. SI2 inclusions may be detectable to a discerning unaided eye. I1, I2, I3: Included. Inclusions are obvious under 10xmagnification, usually visible to the unaided eye. This is the weight of a diamond measured in carats. As the carat weight of a diamond increases so does its rarity and therefore its price. One carat is divided into 100 "points," so that a diamond of 75 points weights .75 carats. The carat-weight of a diamond is the easiest measurement to determine. Most importantly, two diamonds can be of equal carat-weight, but their value can differ greatly due to their cut, color, and clarity. Besides the most famous 4 Cs, Shape is also an important aspect, as the shape generates the most direct visual impact. 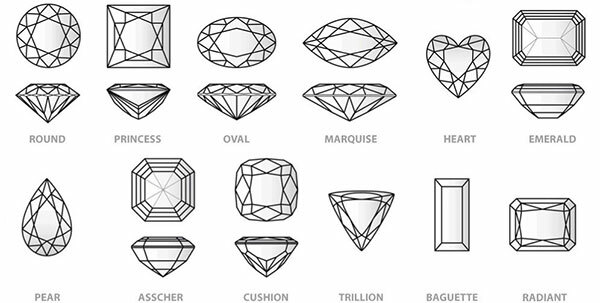 If you know exactly which shape you like and which grade of diamond you want, we recommend you to buy loose diamond. This way is more cost wise. If not, do not worry either. Most online Jewelry retailers offer their own designs or featured collections. PromoPro.com displays for you the most up-to-date diamond coupons and deals. Our editors hand-pick the best-seller Jewelry which can be purchased with the max discount from well-known Jewelry Brands, including but not limited to BlueNile, Diamonds International, James Allen, WatchShop.com and so on. No matter you are looking for engagement rings, or earrings, pendants, diamond watched or just loose diamond, look through our page, you will find the one you love. © 2017 Promopro.com All rights reserved.